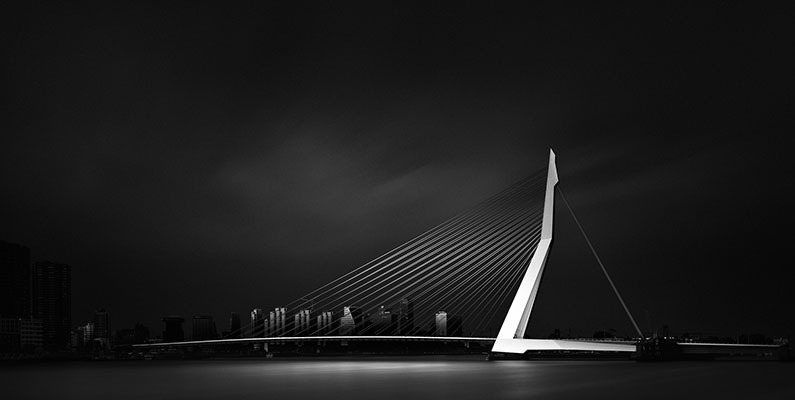 A black and white photography tutorial for Photoshop. Today I want to talk about how I combine these tools in creating my selections. I will guide you through the process step by step and give you my thoughts and solutions for the problems that I encounter. 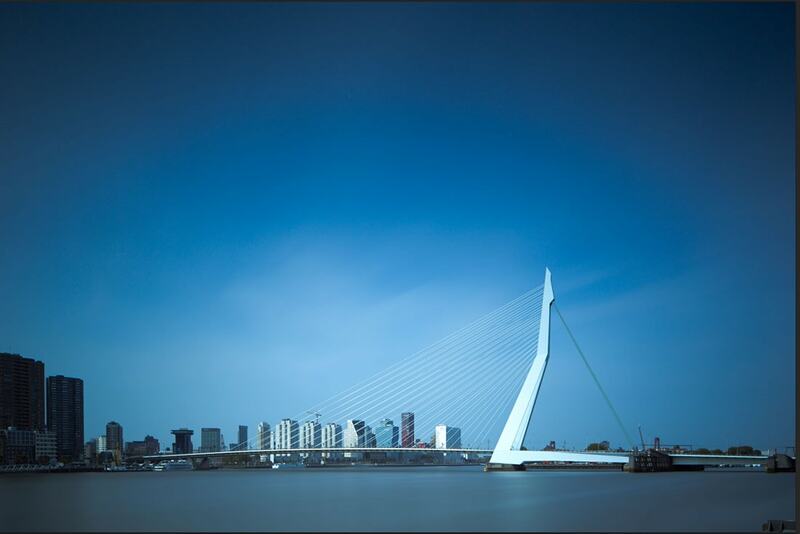 The Erasmus Bridge in Rotterdam. This is the image I will be working on. 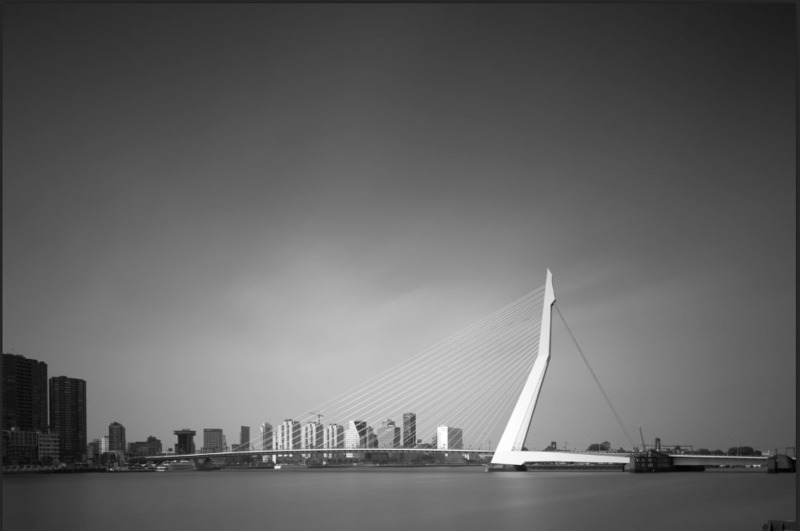 The primary goal is to make a selection of the bridge and a selection of the sky. I begin with the sky. 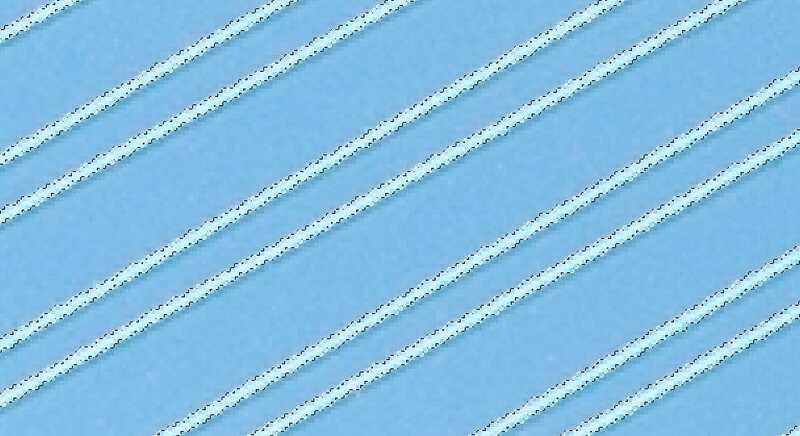 The end result of the selection of the sky viewed in Channels. I used the Quick Mask Mode, Channels and the Pen Tool. 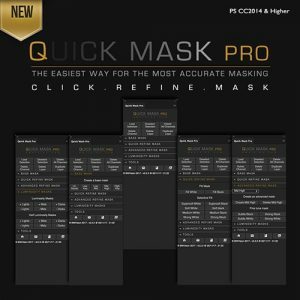 Update November 13, 2017: you can save yourself all the trouble learning this technique in this tutorial and the other selection tutorials and at the same time save a lot of time and be more accurate by just creating selections with the new Quick Mask Pro panel. Before I start creating a new selection in Photoshop, I always look out for the areas that present the greatest difficulty. With that in mind I can start planning my strategy in how to tackle the image. The main problem in this image is the cables. They are only about 5 or 6 pixels wide and have a shadow on the bottom with a tonal value close to that of the sky. Creating an accurate selection of all those cables is going to be tedious. These cables will cause some trouble. 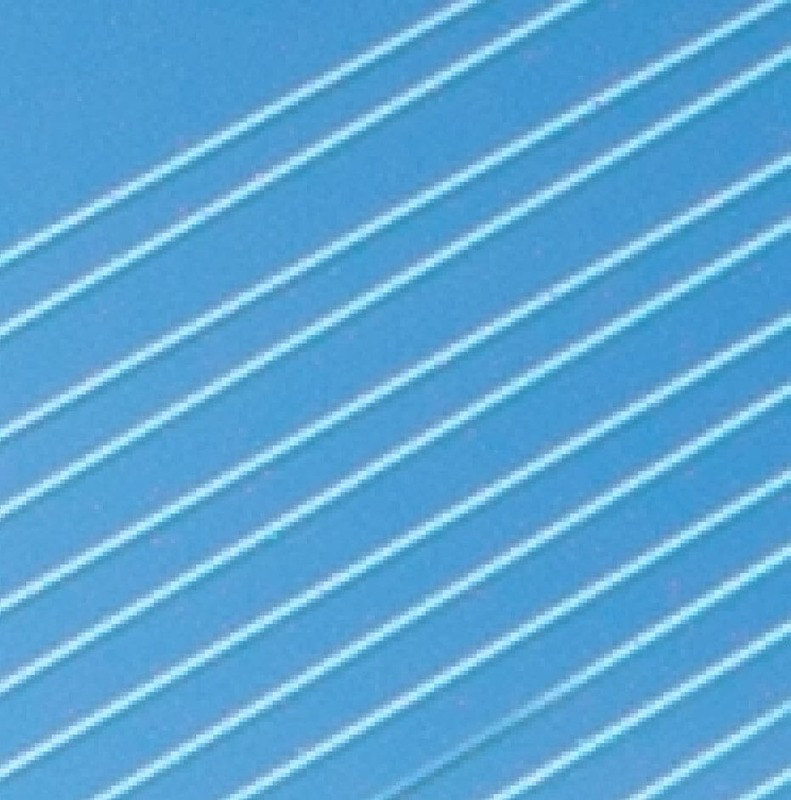 Also note the shadow on the bottom of the cables with almost the same tonal value as the sky. There are also some buildings in the background with odd shapes. These buildings will need special attention. 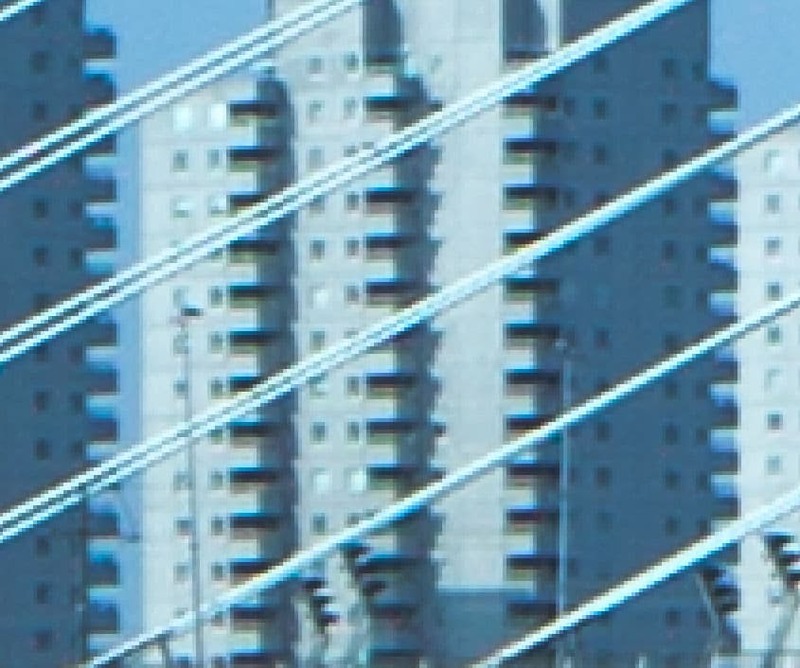 Also note how to cables have a similar color as those buildings. Now that I have identified the problems, I move on to Channels hoping for a quick fix. I pick the Channel that gives me the best contrast, in this case the Green Channel. However, I immediately run into another problem. The only thing I want to select is the sky. This means that the sky needs to be white and everything else needs to be black (remember: white reveals, black conceals). 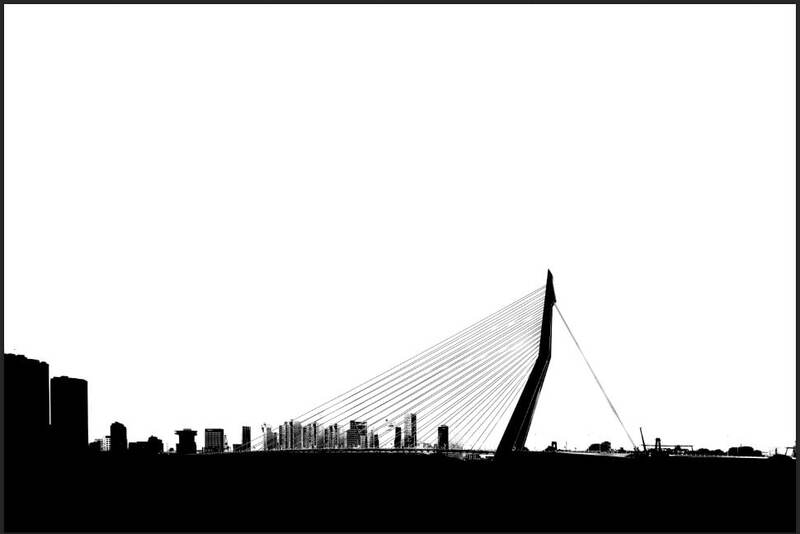 Some of the buildings are already pretty dark, but the bridge and the cables are white. 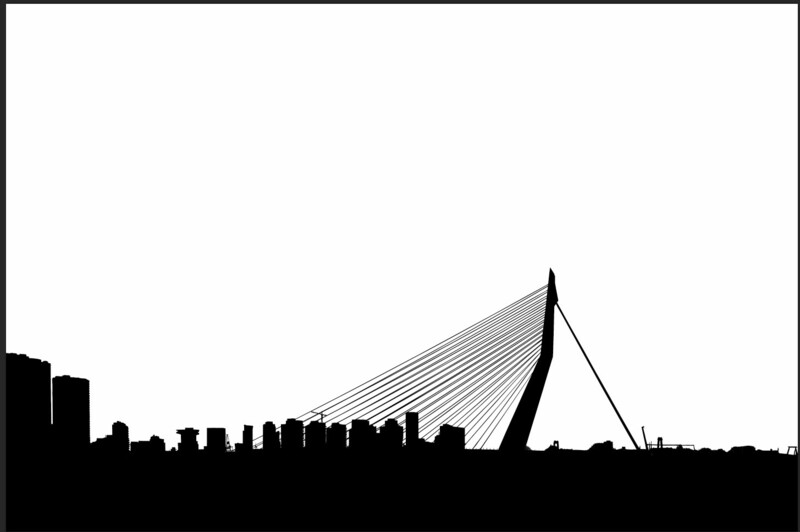 How do I make the bridge black? You can invert the Channel to make the bridge black. The bridge is now masked out, but the buildings are not. It would be ideal if I could combine this inverted channel with the Green channel. 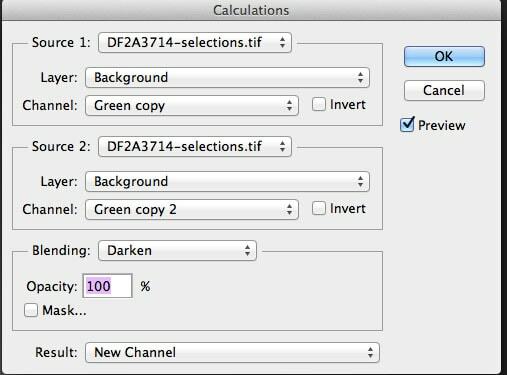 If you want to invert a RGB Channel, make sure to first make a copy of that channel. You do not want to mess around with the original Red, Green or Blue Channels. Activate the channel by clicking on the box right in front of the channel. An eyeball will appear. 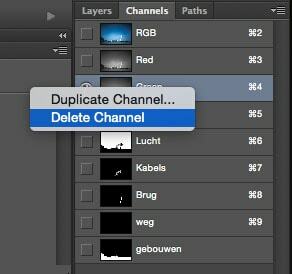 Right click on that channel and select “Duplicate Channel”. Now I have a copy of the Green Channel called “Green copy”. To invert this channel, activate the channel by clicking on the box in front of it and then press “CMD+I” (Mac) or “CTRL+I” (PC). I am going to try something different this time: Calculations. I want to combine the Green Channel with the inverted Green Channel. Again, do not use the orginal RGB Channels. Make another copy of the Green Channel and use that copy. So now I have two copies: “Green copy” (a copy of the Green Channel that I then inverted) and “Green copy 2” (just a regular copy of the Green Channel). With Calculations I combine these two channels. Go to Image –> Calculations. You can select the Channels you want to use in this menu. For Source 1 I selected “Green copy” and for source 2 I selected “Green copy 2”. The trick here is to find a proper blending mode. In this case “Darken” worked for me. For your image “Overlay” might work best or “Color Dodge”, it really is a bit of trial and error. The key is to combine certain features. 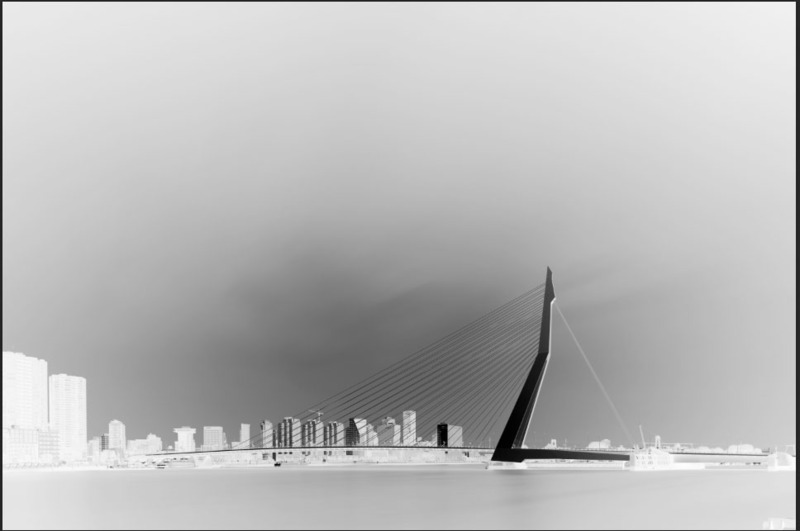 For this particular image I wanted to combine the dark bridge from the inverted Green Channel with the dark(ish) buildings from the original Green Channel. So the goal was to combine the two Channels above into a whole new Channel. You can see the dark buildings and dark sea on top/left image, while the image on the bottom/right has a dark bridge and a light sky. I tried to combine these features with Calculations. This is the result. 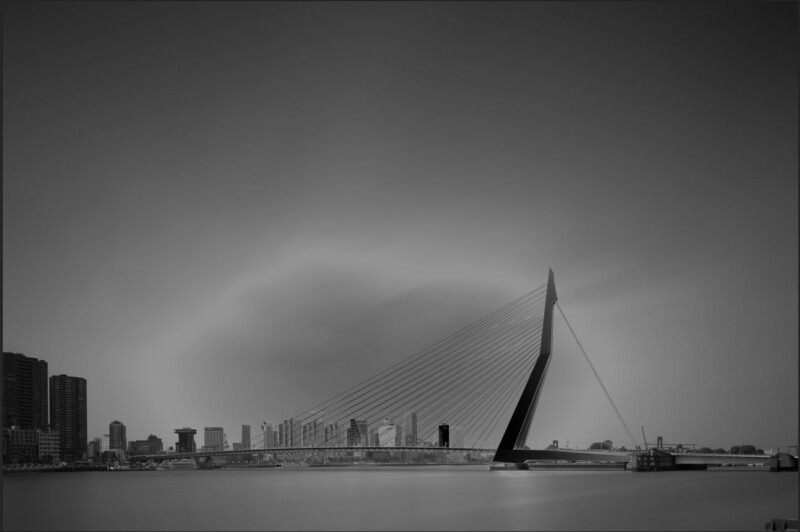 Now I have a dark bridge, sea and buildings. This still needs some further refinement. For instance, the sky is way too dark. I use the Pen Tool to make a rough selection of the sky and fill it with white. I do the same for the foreground and fill it with black. It’s already starting to look better, but it still needs a lot of work. In particular the area around the cables. Here I used Levels to increase the blacks and the whites and tone down the mid greys. This finally looks like a solid base from which I can work on. Now it’s time to start using the Dodge and Burn tools. I clean up the mess around the cables and the buildings with the Dodge tool set to Highlights. 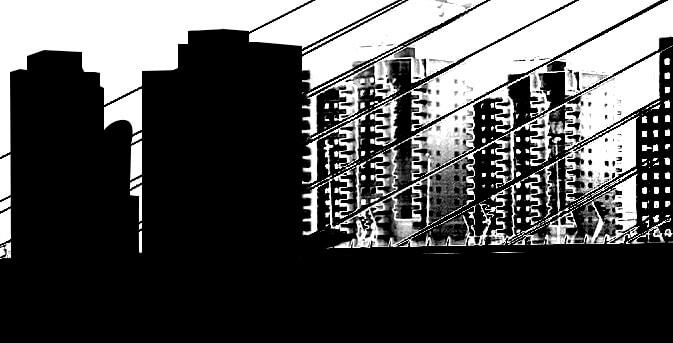 Then I further darken the buildings and the bridge with the Burn tool set to Shadows. It looks almost done. But the buildings look awful. This definitely needs some work. 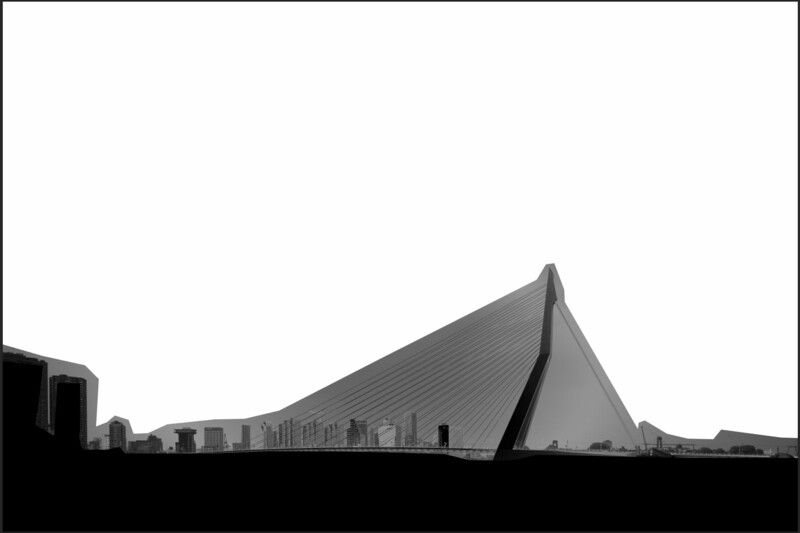 In this case I use the Pen Tool to select the buildings and fill the selection with black. Then I refine it in Quick Mask Mode and refine it even some more with Refine Edge. It’s a bit time-consuming, but sometimes there is just no way around it. The selection is slowly, but steadily improving. I select the general outline of the building with the Pen Tool, then I use Refine Edge to get the little details and finally I refine it even further in Quick Mask Mode. I repeat this for this every building, luckily most of the buildings have straight lines that can be easily drawn with the Pen Tool. When I almost came to an end, I noticed something I talked about earlier. 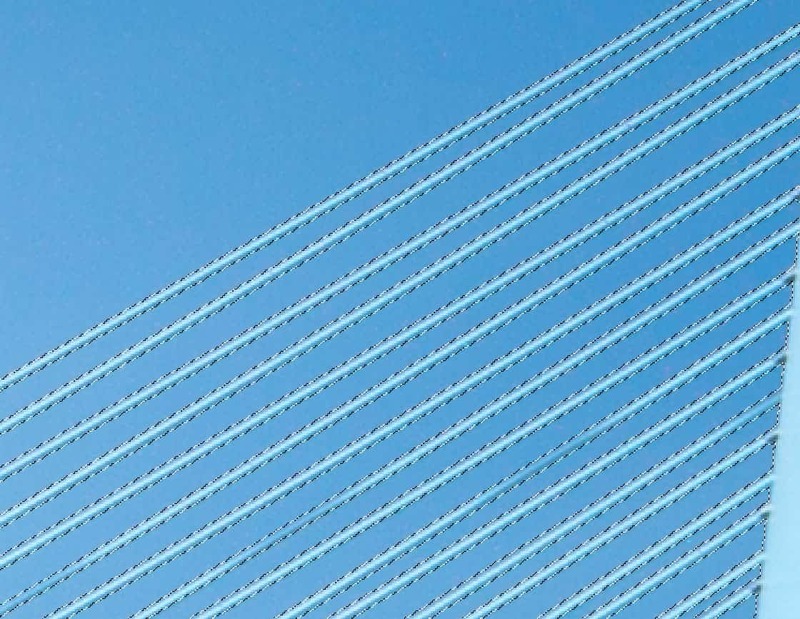 There is so little contrast between the sky and the bottom of the cables, that I accidentally masked the bottom part out when I used Channels. This means that I have to redo the cables of the bridges. All of them. This actually took the most time, about 1,5 hours. I selected all 32 of the cables using the Pen Tool. This looks much better, much more precise. 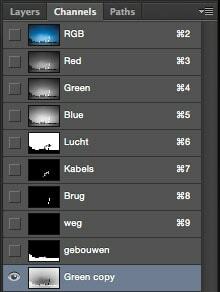 Like I said before, making accurate selections in Photoshop can be time consuming, depending on your image. This image has a lot of complications and it was actually one of the most challenging thus far. However, it only took me about 2 to 3 hours to create an accurate selection. The key is to combine all the tools at your disposal in a smart way. I first used Channels and Calculations to give me some kind of a base. Then, with the Pen Tool, I masked out large areas of the image. After that it basically is a whole lot of refinement using the Dodge and Burn Tool, Quick Mask Mode and the Pen Tool. If I made this selection with only the Pen Tool or Quick Mask Mode, it would have easily taken me 10 to 20 hours.